More Then 7,00,000 apps are on Google Play and Many of them are Free. Many Developers put there apps or games Free on Google Play. Why they Won't charge ? Well, We all want to earn money from any ways then how they earn money from their application. So they do Monetization of their application. 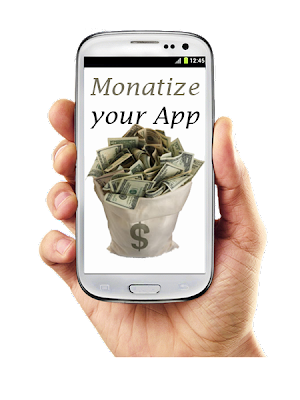 Monetize means Earn money from your Content/Application. So using Best Advertisement Networks you can also earn money from your app easily. I am gone tell you Best Ad networks Provider which used by Top Android application provider(Developer). There are Many providers but some of them are best and easy to integrate into your app. They all having their own certain rules so read full article and find suitable Network for you and integrate it into your app. AdMob is Google's Advertisement Service. as Google AdSense is for Websites that display advertisement according to your content AdMob also do the same but on Mobile Devices. I think AdMob is used by each and every developer. Pay out on the bases of Impression. As it is from Google it is Highest paying network for Advertisement. AdMob allows you to Filter ads on the bases of your Application or requirements. Millennial Media is Great Alternative For Developer who just don't want to go with Google Admob and its rules. well Millennial media is growing Ad network in Mobile advertisement market. Around 64 % of Android Games uses Millennial media for their in app Advertisement. It is also much popular in IOS Advertisement. Millennial media consider many points for pay outs (not fixed) so check their official site. LeadBolt is Growing Advertisement company in the market. it is not well known as above but having great advantages for developer and producers. As it is growing its payment rate is high and having less trouble to add this in your app. there are increasing Advertisement producer with this company so you can get good out of them. you can decide which kinds of ads display in your app. that's the main benefit you have with LeadBolt. Last but not least mAdserve is open source Ad network. while above three are proprietary it means it won't allow you to change how ads look like. you can not change the layout of the ads with all these above Api. mAdserve Allow you to connect with multiple mobile ad networks so you can add multiple networks and earn more money from your app. So these are the some of the best and famous networks which allow you to monetize your apps and get money from it. this is just review about all these networks if you want to learn how to integrate it subscribe to our blog for my future tutorial on it. these Ad networks are at top but if i missed any other or you think it should come in the list then post it in comment below i will appreciate it.